…but admittedly, it is not my strong suit. All I know is that on a chilly night in December (2018), I was walking towards the front door of my apartment building and saw a circle in the sky around the moon. I thought something was wrong with my glasses, or worse, my eyes. 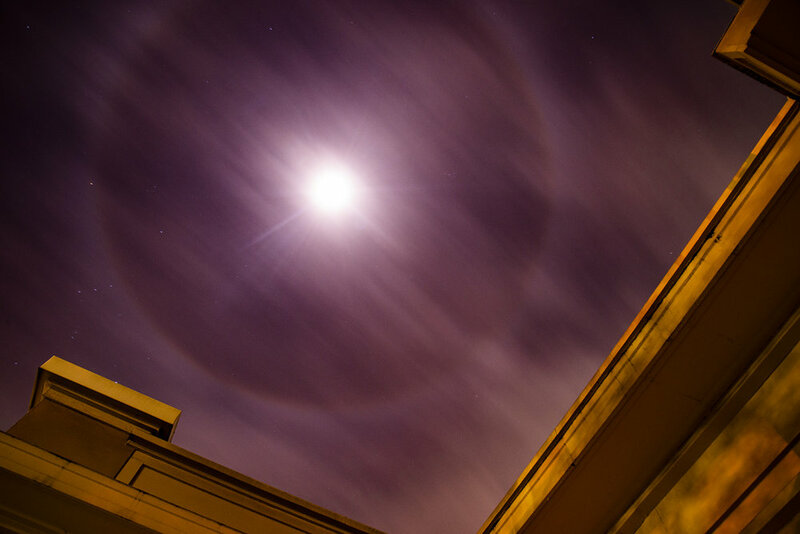 Upon instantly searching google, I learned of the phenomenon of a “moon ring,” or 22° halo. If you’d like a full explanation, this wikipedia page, or this article might do the trick, but my quick takeaway from the reading is that ice crystals in the atmosphere are refracting moon light towards you, hence the visibility of the moon halo. Cool stuff Planet Earth. Keep wowing.